At the Glassbox event, we set up Neobox as a wall for people to doodle on, and suprisingly it was a pretty big hit =) It basically allowed people to draw neon glowing lines on a projected wall using infra-red light pens. 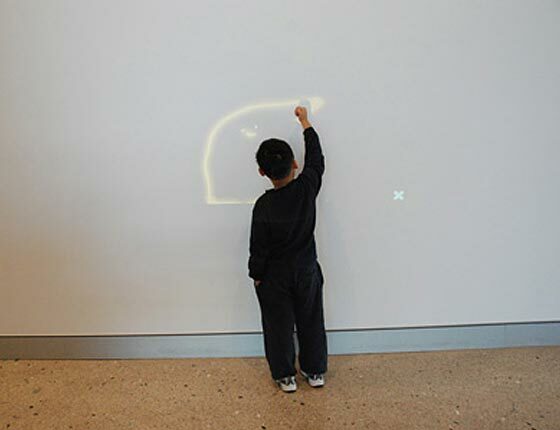 The infra-red light part was inspired by Johnny Lee's wiimote projects, in particular the wiimote whiteboard application. The wiimote whiteboard allows you to use a wiimote (that is connected via bluetooth to a computer) to control the mouse movements of a computer, using infra-red lights. Check out Johnny Lee's youtube clip to see it in action. As for the drawing part, Haline and I created a drawing application, using flash, to draw neon glowing lines. This was kind of inspired by the light photos we did, where we bascially created drawings out of thin air using lights. The time limit of the light photos was also added to make things quick, so people wouldn't be to precious about their drawings, and just keep creating new ones. Some people were a bit freaked out by the time limit though, but I think it was still good for people to just try it again if they didn't like their previous attempt. The aim was to make it as un-inhibiting as possible, and make it easy and fun, so that anyone could draw on the wall. There were quite a lot of creative people on the day, with pretty cool drawings - some of which can be seen here, or in the slideshow below. However, there were also a lot of people who were stumped by the blank wall, not knowing what to draw. To try and give them ideas, we also had a suggestion box, which ended up doubling as a pictionary ideas box too. Click above to try the neon drawing application.